Back when I was in college I read an article that explained how Jane Austen used to hide a notebook under a cushion in the drawing room, so whenever she had a spare moment she could pull it out and scribble down her ideas and thoughts. 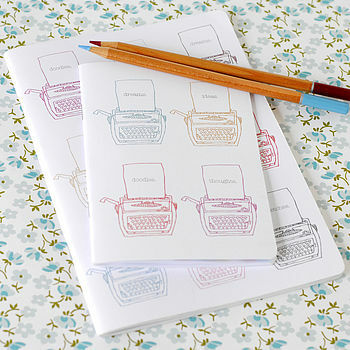 From that day forward my heart was swept up with the idea of notebooks. You see, before that I'd always perceived Notebook People as a sort of mysterious, underground demographic. They wore weird glasses, wrote transcendental poetry, and collected bumper stickers to paste inside their angst-filled notebooks. I remember watching a neighbor stop talking mid-sentence in order to pull a beloved notebook from her bag and begin furiously recording...I can't actually remember what it was that we were talking about that warranted immediate transcription. But I do remember thinking, "Ah. Notebook People. They're different." But Jane Austen's notebooks presented me with a new concept. Suddenly the keeping of a notebook didn't have to signify membership in a specific social demographic, or evidence of one's dark underworld. Notebooks don't have to be wildly decorated, or made of expensive moleskin. And most of all, one single notebook doesn't have to be the overarching, tangible representation of your life, like human cliffnotes. That's why I have about twenty-seven notebooks floating around at any given time, give or take a handful. Those 25 cent spirals from Wal-mart can become addictive, sneaking their way into my shopping cart, and I have a soft spot for the pretties. Paper covered or fabric covered, there is just nothing as hopeful as a lovely, pristine new notebook. It's difficult carrying on our person all of our thoughts, ideas, and feelings as we move through life. We all need repositories. A spouse is a good option, but if the Game is on in the background then he becomes more of a sieve. And when the day is long and the kids are loud, the weight we place on our spouse's sounding boards can be a heavy load to carry. So instead, we have notebooks. For recipes, lists, spiritual insights, our Big Ideas, journaling, and most importantly, the casual, ordinary thoughts that together add up to be a pretty good portrait of what we love and who we're trying to become. Virginia Woolf argued that women's creativity requires a room of one's own and five hundred pounds a year. I'm not sure Jane Austen always had those luxuries, much less the rest of us- my computer is in our toy room! But what we do need is more notebooks. Under the bed. In our desk drawers. Buried at the bottom of the diaper bag. And tucked under couch cushions in the drawing room. The important thing is that we designate a specific place for our thoughts to go, a steady landing strip. That way, three weeks later when we are wondering, "What was the name of the Asian cafe my neighbor recommended?" or "What were the little-girl baby names I was going to suggest to my friend?" It's all there. Waiting. So long as we write it down. 7. Faith in God and his plan. We are not left alone, flailing in this life! 20. Setting. All my stories begin with a "where"